Tesla delivered the first of its new and much less expensive battery-powered cars last week, betting that it can move beyond producing a relative few luxury vehicles and become a mass producer. California has a big stake in whether Musk’s “moment of truth,” as the New York Times terms it, pays off. California’s politicians and civic leaders have portrayed Tesla as the crown jewel of the state’s efforts to build a new economy for the 21st century while dramatically reducing carbon emissions. Gov. Jerry Brown has set a goal of having 1.5 million battery- or hydrogen-powered “zero emission vehicles” or ZEVs on California roads by 2025, roughly five times their current numbers, with ZEVs being 15 percent of all new car sales by then. Toward that end, the state has been an indirect investor in Tesla through corporate tax breaks and direct subsidies to purchasers of its cars. Tesla has also benefited handsomely by selling credits to other automakers in lieu of their meeting state quotas for making and selling ZEVs. If Tesla doesn’t deliver on its ambitious production and sales goals for Model 3 and finally become profitable, it will not only be a huge setback for Musk and other stockholders, but for the politicians who are also betting on its success. 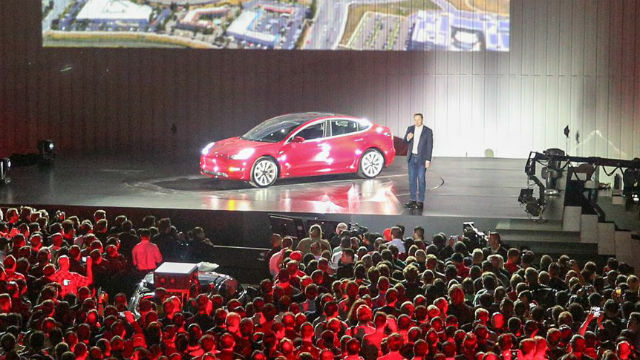 About a half-million potential Model 3 purchasers have put down deposits for the long-awaited Model 3, and Musk has set a target of producing 600,000 cars a year by 2018. But a shortage of battery packs limited production to just 25,000 in the second quarter of this year. One factor in Tesla’s ability to meet its goals is that it’s about to lose a very important federal tax credit for purchasers. The subsidy begins to phase out once an automaker reaches 200,000 in ZEV production and Tesla is on the cusp of doing so. It’s likely that few, if any, of Model 3’s purchasers will receive the $7,500 tax rebate. One question for California legislators, when they return to Sacramento after a mid-summer recess, is whether the state should replace the vanishing federal subsidy. The Assembly has passed Assembly Bill 1184, which would do exactly that, and it’s nearing a decisive floor vote in the Senate. Carried by Assemblyman Phil Ting of San Francisco, the measure would spend $500 million a year from auctions of cap-and-trade carbon emission allowances to new subsidies just for electric car purchases. Initially, the subsidy would reduce the net price of the ZEV to that of a conventional compact car. The bill’s sponsors are listed as two groups founded by billionaire environmentalist — and potential candidate for governor — Tom Steyer, Advanced Energy Economy and NextGen Climate America, Inc. Although neither the bill nor legislative staff analyses specifically mention Tesla, it’s evident that by confining the very generous new rebates to battery-powered cars and excluding ZEVs powered by hydrogen or hybrids, the bill’s major effect would be to help Tesla sell Model 3s in California. One sharply critical analysis by the Senate Environmental Quality Committee staff cited its very narrow focus and its demand on limited and variable auction proceeds and suggested that it be held over until next year. However, the committee added its endorsement, indicating that the measure has the blessing of legislative leaders.